We include several excellent video clips from YouTube/Vimeo. Please Be Patient - it may take a few minutes for our site to display the videos. Quantum physics appears to offer a description of reality that is radically different from the one relativity gives us. Rather than giving a single observable solution to a problem, laws that operate at the subatomic "quantum" level provide probabilities of observing one of many possible results. Quantum mechanics is a relatively new branch of science developed to explain why subatomic particles do not behave according to the Newtonian and relativistic laws that describe the behavior of "normal" size objects. Just prior to the time subatomic particles and events were first measured, physicists had declared that, with very minor exceptions, all the fundamental forces and laws of the universe had been discovered and described. When scientists started to apply the traditional laws of physics to nuclear reactions they were literally amazed to find that the laws did not work! The search was on for a way to modify Newton's and Einstein’s laws to explain the new phenomena. At the time no one knew the explanations would shake the very foundations of western knowledge. Light is made up of energy in the form of "photons" which have mass (in motion) and which behave like particles, some of the time. 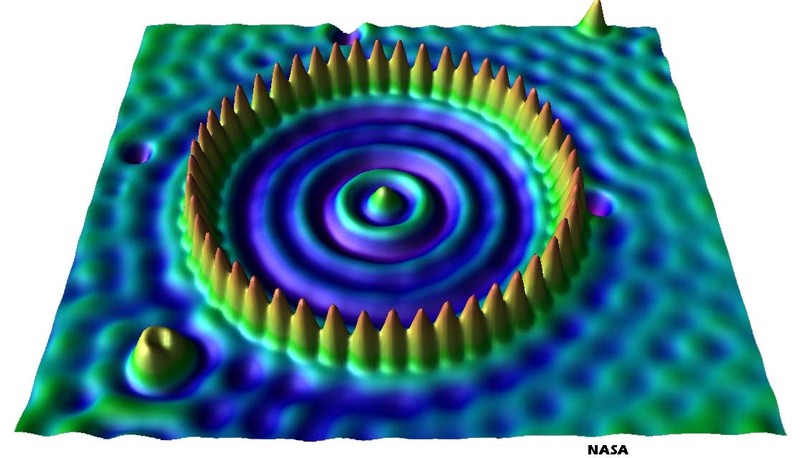 The rest of the time photons behave like waves of energy, similar to ocean waves. If you will think about an ocean wave you will realize water making up the wave simply moves up and down, not forward. Only the wave itself moves forward. Thus if a boat is sitting a mile from shore, each wave will cause it to rise and fall, but will do little to move it toward shore. The boat will move a bit as each successive wave exerts a slight pushing force in the direction of the shore, but the boat won't be carried to shore by any one wave as the wave itself sweeps toward land. The vast majority of the water is simply moving up and down, while only the wave moves forward. The problem occurs when you try to measure photons using different tests. Some tests detect "particles" of light hitting targets while other tests detect "wave" interference when light passes through narrow slits. Back to the ocean example, when two ocean waves meet they either cancel each other if the trough of one overlaps the crest of the other, OR they reinforce each other when the crest of one joins the crest of the other, forming a single doubly big wave (any combination in between can occur). When two waves interact they are said to be interfering with each other. The problem is a particle CANNOT act like a wave and a wave CANNOT act like a particle, yet photons act like both! The solution of modern physics to this apparently unsolvable problem is to say that photons are neither waves nor particles until they are measured, and that the measurement itself determines the nature of the photon. In other words, it is the measurement of the event that determines the nature of the event. To some degree this phenomena can be said to express hidden problems with what reality really is. In a sense physics is not able to describe the "reality" of an individual photon since it appears to have two inconsistent, coexistent, yet separate, natures. To the extent the point at which a photon is measured (known as the collapse of the wavefunction) can be considered an "event", an unsolved dilemma occurs in determining when the event "actualizes". If light is both a wave and a particle until measured, is it "truly" a wave (when measured as a wave by an interference experiment) at the point it interferes with itself, or at the point it strikes a photographic plate, or at the time the film is developed, or at the point a human observes the final picture, etc.? The answer is simply not known. One of the greatest scientific shocks of this century came in the form of the Heisenberg uncertainty principal. As far as many scientists and philosophers were concerned the last straw was when, to help explain the observed phenomena, Heisenberg noted that if you measure the momentum of one of the particles ("momentum" is velocity, which is speed in a given direction, times mass) that make up an atom you must in some way affect its position in an undeterminable way. For example, if you measure the momentum (or velocity, the uncertainty principal is equally true for both momentum and velocity) of a subatomic particle by "observing" it move over a given distance, the observation alters its position in some unpredictable manner. Similarly, if you measure position you must alter momentum, thus at any given moment you CAN NEVER measure both the exact momentum and exact position of a subatomic particle. The more precise you are in measuring momentum, the less precise you will be about position, and vice versa. The problem is actually more than a problem of measurement, to be more accurate, the wave function of a subatomic particle (which describes the particle at the quantum level) that has not been "observed" is precisely determined (without using probabilities) by a formula known as Schrodinger's wave equation. However, the very moment you attempt to measure the momentum or position of the particle, the wave function collapses, introducing probabilities into the equation, and the exact momentum and position of the particle CANNOT be determined. Heisenberg's theory can be interpreted as supporting the proposition that at the quantum level the very concepts of momentum and position have no real meaning. At the level of measured observation, modern physics can tell you how many particles in a group of particles have certain momentums and positions, and how many have other momentums and positions, but physicists CANNOT tell you what the momentum and position of any one particle is. This failure is far more than just some inability to measure momentum and position, it is due to the fact that it is fundamentally uncertain what the momentum and position of any single observed particle is! A single particle when measured simply does not have position and momentum in any normal sense of the words, but members of a group do, and the probability of x number having x momentum and x,y,z position can be precisely computed! To emphasize the significance of the uncertainty principal remember it says that the uncertainty about momentum and position is not due to limitations on humankind's ability to make measurements, but rather is based on the apparent fact that when observed the momentum and position of an individual particle is fundamentally uncertain. Of course, future physicists may find an underlying set of rules that can be used to predict the behavior of individual particles, or may discover a fundamental unified law which is consistent with the observed behavior (an atemporal model may be found that works). Even though many questions remain unanswered, repudiation of the uncertainty principal, however comforting it would be to philosophers, seems uncertain at best. Here are some very good videos about Quantum Physics (beginner-intermediate). The following three videos are from a movie "Down The Rabbit Hole". We were really hesitant to feature them because the movie was sponsored by a "cult", Ramtha's School of Enlightenment, whose founder claims to channel a 35,000-year-old being called Ramtha the Enlightened One. However the video clips we selected are really very good at explaining quantum effects. Please do not think that the new age spirituality in the film is based on physics, in other words consider everything in the movie highly controversial metaphysics except these video clips (even they are slightly wrong). Also note that Vimeo advertises other videos, we do not know what Vimeo suggests so we don't recommend the selections. Dr. Quantum and the Double Slit Experiment from WTB on Vimeo. Dr Quantum and Entanglement from WTB on Vimeo. Dr Quantum visits Flatland from WTB on Vimeo. The concept of wave-particle duality tells us that the properties of electrons and photons are fundamentally very similar. Despite obvious differences in their mass and charge, under the right circumstances both suffer wave-like diffraction and both can pack a particle-like punch. Yet the appearance of these objects in classical physics is very different. Electrons and other matter particles are postulated to be elementary constituents of Nature. In contrast, light is a derived concept: it arises as a ripple of the electromagnetic field. If photons and particles are truly to be placed on equal footing, how should we reconcile this difference in the quantum world? Should we view the particle as fundamental, with the electromagnetic field arising only in some classical limit from a collection of quantum photons? Or should we instead view the field as fundamental, with the photon appearing only when we correctly treat the field in a manner consistent with quantum theory? And, if this latter view is correct, should we also introduce an “electron field”, whose ripples give rise to particles with mass and charge? But why then didn’t Faraday, Maxwell and other classical physicists find it useful to introduce the concept of matter fields, analogous to the electromagnetic field? The purpose of this course is to answer these questions. We shall see that the second viewpoint above is the most useful: the field is primary and particles are derived concepts, appearing only after quantization. We will show how photons arise from the quantization of the electromagnetic field and how massive, charged particles such as electrons arise from the quantization of matter fields. We will learn that in order to describe the fundamental laws of Nature, we must not only introduce electron fields, but also quark fields, neutrino fields, gluon fields, W and Z-boson fields, Higgs fields and a whole slew of others. There is a field associated to each type of fundamental particle that appears in Nature. String Theory HR - A very good overview of String Theory. Author Patricia Schwarz enthusiasm and communication skills provide a good introduction to strings (beginner). Quantum cosmology is the application of quantum theory to the universe as a whole. At first glance, this may be a purely academic enterprise, since quantum theory is usually considered to be of relevance only in the microscopic regime. And what is more far remote from this regime than the whole universe? This argument is, however, misleading. In fact, quantum theory itself argues that the universe must be described in quantum terms. The reason is that every quantum system except the most microscopic ones are unavoidably and irreversibly coupled to their natural environment, that is, to a large number of degrees of freedom coupling to the system; an example would be a small dust grain in interaction with air molecules or photons. There exists then only one quantum state which entangles system and environment. The environment is itself coupled to its environment, and so on, leading ultimately to the whole universe as the only closed quantum system in the strict sense. It is entanglement with macroscopic degrees of freedom that also leads to the classical appearance of macroscopic bodies, a process known as decoherence. Decoherence is well understood theoretically and has been successfully tested in a variety of experiments. The universe as a whole is thus at the same time of quantum nature and of classical appearance in most of its stages. There exist, of course, also situations where the latter does not hold and the quantum nature discloses itself; these are, in fact, the most interesting situations, some of which we shall discuss in the course of this article. Conceptually, quantum cosmology is therefore not necessarily associated with quantum gravity. However, since gravity is the dominant interaction at large scales, any realistic framework of quantum cosmology must be based on a theory of quantum gravity. Although there is not yet an agreement on which is the correct theory, there exist various approaches such as quantum general relativity and string theory. Comment - There has been a lot of recent interest in what once seemed to be an impossible question, what happened before the Big Bang, the starting point of our universe? For many years it was assumed that any physical process that triggered the Big Bang was outside time and space, and that there was no answer to the question. We are now confident that the uncertain nature of quantum measurements might allow for fluctuations in the energy that was in the universe before the Big Bang, which in turn could have triggered the Big Bang and generated matter (Energy = Matter X the Speed of Light squared). A quick look at the Higgs Boson. A boson is a particle which has a whole number spin ('spin' is a quality assigned to subatomic particles that is not like the spin of a top). A photon is an example of a boson which has a spin of 1. Bosons are different from Fermions, which are particles that make up matter, because they obey Bose-Einstein statistics. Bosons are loosely thought of as the particles that make up energy. This means that you can put two Bosons in the same place at the same time. "Gauge bosons" carry forces. There are three known gauge bosons which are fundamental particles. The four gauge bosons are: photons for electromagnetism, gluons for strong force, and W and Z bosons for weak force. Other theoretical gauge bosons are predicted, such as gravitons for gravity and the Higgs boson, a type called a scalar boson. We use Google Analytics to make our sites better. WikiPedia Content Used Under Creative Commons License Some images courtesy WikiMedia and NASA.